Danny Tanner and Michelle Tanner are reunited again! At least one of the Michelles, that is. Bob Saget, 59, celebrated his official opening night as a cast member of the Broadway play Hand to God on Friday and met up backstage with none other than Ashley Olsen, 29, who shared the role of his youngest daughter on the '80s and '90s sitcom Full House with twin sister Mary-Kate Olsen. Saget and Ashley were photographed together backstage at the Booth Theatre with other Hand to God cast members. The actress, who has a fashion empire with her sister, was dressed entirely in black, sporting what appeared to be a black jacket, pants and chunky heels, paired with dangling, beaded turquoise earrings, while Saget wore a black button-down shirt, paired with gray jeans and black tennis shoes. The naturally light blonde also sported what appears to be strawberry blond tresses. "Loved having my dear friend Ashley Olsen at my welcoming opening of @HandToGodBway last night with the brilliant cast I get to act with: Steven Boyer, Geneva Carr, Sarah Stiles, and Michael Oberholtzer," Saget wrote on Instagram on Saturday morning. "Almost time for the matinee today. Can't wait." Saget joined the satirical play as Pastor Greg earlier in the week. He had made his Broadway debut in the musical The Drowsy Chaperone in 2006. Saget has reunited with his Full House cast mates, including the Olsen twins, several times since Full House ended its eight-season run in 1995. He and Ashley were previously photographed together in December 2014 at the Cool Comedy—Hot Cuisine charity benefit at Caroline's On Broadway in New York City. The Olsen twins live in town. Saget is set to reprise his Full House role on the new Netflix spinoff, Fuller House, which also features most of his former cast mates. The Olsen twins, however, will not appear on the new show. 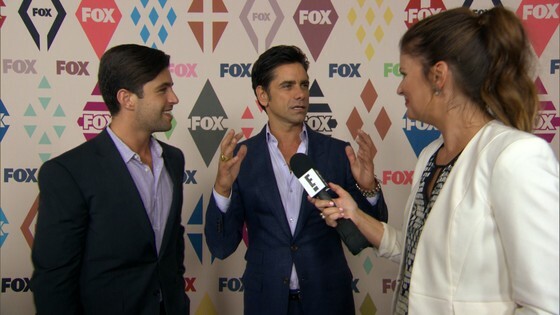 John Stamos Pokes Fun at "Full House" Hair!